Adorable Cozy Panda costume dress for women has a panda face hood. This comfortable Cozy Panda Costume includes the zipper front fleece dress in black and white with a panda face hood with ears and a fuzzy tail in back. 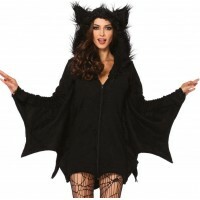 An easy to wear costume you will love to slip on. Item Number: LA-c85576 | Approximate Size (Inches): 10.00 wide x 3.00 deep x 14.00 high | Approximate Shipping Weight: 2.00 lbs.